SUNY Buffalo State has appointed Larry Maheady as the college’s first Horace Mann Endowed Chair in Exceptional Education. Maheady, who has authored or co-authored more than 85 articles in education and psychology peer-reviewed journals, enjoyed a 28-year career at SUNY Fredonia before joining Buffalo State this fall. The endowed chair—the college’s third such position—was made possible through a bequest by Horace Mann, Buffalo State’s beloved and legendary SUNY Distinguished Service Professor Emeritus of Exceptional Education, who passed away in 2010 at the age of 88. Before he retired in 1992, Mann helped to educate more than 7,000 exceptional education teachers over his 40-year career at Buffalo State. For the rest of his life, he maintained a close relationship with Buffalo State, with an office on campus and extensive service to the college. His bequest, which included $1.5 million to establish the endowed chair, in addition to many other instances of his generosity, make Mann one of the college’s largest donors. 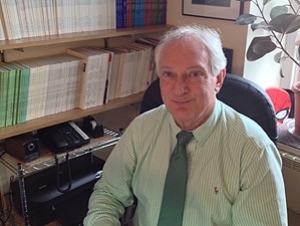 Maheady, who holds a Ph.D. in special education from the University of Pittsburgh (1981) and a master’s degree in school psychology from the University of West Florida (1975), was an active scholar and researcher during his long tenure at Fredonia, presenting his work at more than 150 international, national, and state-level conferences and conducting more than 250 staff development sessions in 29 different states. His primary areas of interest include evidence-based education, peer-mediated learning, and preparing high-quality teachers for twenty-first century schools. In 2004, Maheady received the SUNY Chancellor’s Award for Excellence in Scholarship and Creative Activities and the SUNY Foundation Award for Research and Scholarship. Maheady and colleagues from Fredonia and Buffalo State are currently engaged in a multi-year research and professional development series with local school districts to examine the effectiveness of Kagan cooperative learning structures on pupil learning. They also will evaluate the impact of an instructional coaching model on teacher practice and the use of formative assessment data and single case research designs to meet Annual Professional Performance (APPR) review goals for participating teachers. Maheady and his wife, Bethany, have three sons: Jason, Joshua, and Connor.